You know what I mean, it’s the thing that turns your normally sweet, obedient dog into a crazed lunatic. It’s the thing that renders your Sit and Stay commands totally useless. 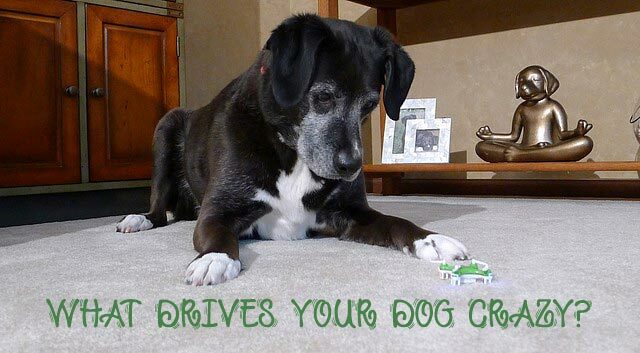 It’s the thing that triggers the “Game On!” mode inside your dog’s brain. For some dogs it’s squirrels, for others it may be laser pointers but usually there’s something that temporarily sends most Rovers off their rockers. For Haley, there’s not just one thing that drives her crazy. She goes into overdrive with bugs, balloons, bubbles and beach balls. No, it’s not that she can’t control herself around objects that start with the letter “B”, it’s objects that fly through the air that send her into a frenzy. Here are the latest flying objects that challenge her self-control. Quadcopter Drones! I have to admit, I’m not a big fan of drones either, especially the large drones that some intellectually challenged people fly around airports or others use to invade people’s privacy. The small quadcopter drones are kind of fun but dogs tend to chase them because they look, sound and move like bugs and after reading the articles below, I can see why dogs might have a few more reasons to hate drones. Will Drones Replace Dogs Down on the Farm? Drones are the new dogs? Really? 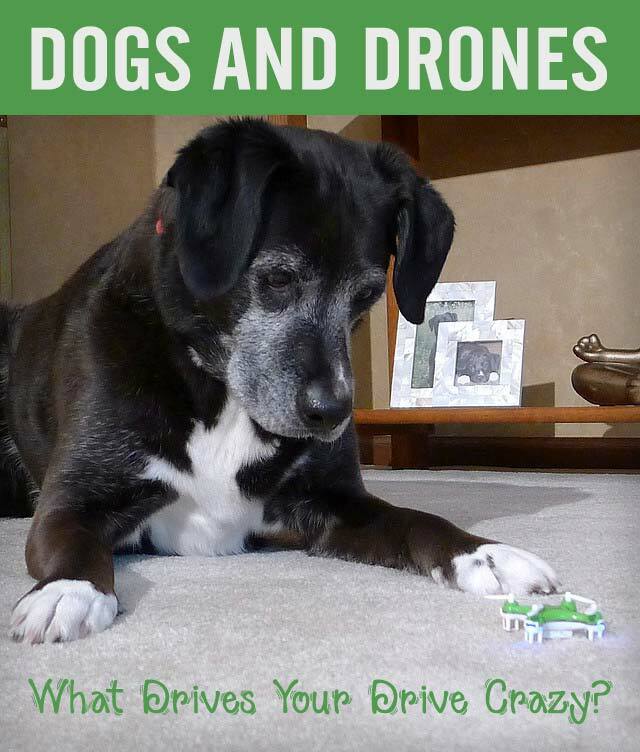 Okay, that last article was a more humorous take on drones and dogs. The truth is, it’s not all bad news when it comes to the relationship between canines and those hovering UAVs. Here are a few positive ways they work well together. If you watched the video in the last link, be sure to visit samedaypups.com and click around a little. You might be surprised what you find there. I guess drones can be both good and bad for dogs, but since Haley gets so obsessed with the nano and mini versions, she’s going to have to be satisfied with limiting her chasing skills to the occasional housefly that manages to make it through the backdoor. Surely Haley’s not the only dog that gets a little nutty sometimes. 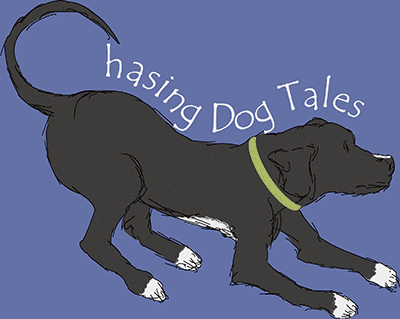 What drives your dog crazy? What drives me crazy? When she has food and does not give me any. No matter what it is. I want it. Are you a beggar, Piranha? Haley says it works for her, lol! We can handle most things, even flying things are fine, but wabbits and squirrels drive us mad. Ah yes, the rabbits and squirrels! As a certified and award-winning tracker, you’ve got the nose for finding them, Emma. ? Kelly and Ike would probably sleep and not even notice a drone unless it landed on their head. You never know what they’re going to do with drones next, but I hope they don’t really decide to try to deliver puppies! I still can’t imagine how the drone package delivery will work. Even with GPS systems, the drones aren’t always reliable. But, they might be more reliable than the postal service. ? Noises. Nothing sets us off more than noise. Squirrels are fun, but nothing compared to noise. No particular noise either anything will cause a reaction. Yep, and then there are all the noises they hear and we don’t, lol! It’s really nice having a watchdog though. This is AMAZING, not to mention that drone is the coolest thing. Rae would have a blast! They are a lot of fun but I’m horrible at flying it. If you’re good with video game controllers it’s probably easy but I mostly practice crash landings! Cocoa sounds hilarious, you’ll have to do a video of her antics and craziness! She must be all about having fun and celebrating life. ? hahaha what a great video, cute cute cute. Thanks, JoAnn! Once I put the music to the video it seemed like Haley was almost dancing to the beat. Maybe I should have changed the title to “Dances with Drones”. Remote control cars……. nuff said! LOL! Jenna, I would LOVE to see a video of that! ? That was a riot! I wonder what Haley would do if she ever caught it? Although she didn’t seem to anxious to actually grab it! For Daisy, it’s really weird – it’s the dishwasher. She watches when we’re putting things in, and she knows if it looks full, it’s going to go on soon. When she hears it latch, she comes flying into the kitchen like a crazed lunatic (ergo her middle name, “Lunatic”!) so fast she slides across the floor and slams into it. If we don’t turn it on right away, she’ll start whining at it hysterically and stops immediately as soon as we turn it on and she hears the water running. Then she stares at it up close, looks all around it for a while, and finally walks away. When it’s done and it beeps, she’ll fly in again and whine, looking at us as if to say “Open it! !” Go figure! Oh my gosh, that is so funny! I wonder what she’s thinking? When my son and daughter-in-law watched Haley once, she was intrigued by their front loading washer. They said she stared through its window the whole time it was running. Cute video! I’m pretty sure that would make Rita crazy, cuz she also hates it when a fly gets in the house! Our last dog was insane for the laser light and for any reflections. Good grief, just tearing a piece of foil off the box would bring her charging into the kitchen because of the reflection on the ceiling! One of my parent’s dogs was that way too after my son played with a laser pointer around her. She became really obsessed with lights and reflections. Haley loves to chase a laser light but she knows where the source of the light comes from so when I put it away, she forgets about it. I rarely use it though because I don’t want her to get obsessed. I need one of those drone copters for puppy Bailey. It looks like so much fun. My two cats drive Bailey crazy. All of the rules and commands fly out the window whenever she’s interacting with them. Aw, I bet they all have a lot of fun together too. ? Horses. Mr. N can not control himself around horses at all. That’s interesting. Does he challenge them or just get excited and want to play? My parents used to have a horse farm and I think Haley thought they were just big dogs. Sometimes she would play bow in front of them, lol! I wouldn’t mind a bit if Harley (and Jax) went crazy if I stopped by for a visit! Aw, that sound must really bother her. Haley doesn’t like the beep when a smoke detector battery needs changed. I can’t say I blame her, it’s so high-pitched and annoying. Drones would definitely not be a good thing around your house, Dolly. I hope nobody decides to fly over your yard. Liam the pug goes wild when he sees dogs on the television. Big or small, short or tall, he wants to leap through the screen and tell them hello. I have no idea why. And lately, he’s been branching out and has been barking and whining at chickens on television. You’d be surprised at how many there are, too! Even Boardwalk Empire had a chicken on it the other week, and Liam noticed that, for sure! Haha, that’s so funny, dogs and chickens! Haley doesn’t pay attention to the TV at all. I loved Boardwalk Empire, Steve Buscemi was great in that series. ? Aw, Jack and Maggie are such good ambassadors for slimdoggy. ? Squirrels! They drive Linus crazy! He barks at them from the house then chases them up the trees in the yard. I bet that’s the top answer for “What drives your dog crazy?”. I almost feel sorry for the poor squirrels…shhh, don’t tell Haley! ? I can’t stand drones! I see them as more nuisance than beneficial. Squirrels drive my Husky absolutely nuts, while my little Havanese mix gets angry & goes wild when a fly gets too close! Love your video, that actually looks like a fun dog toy LOL! Thanks, Cathy! I agree about the big drones, I’m glad there are new proposed laws in the works to protect air traffic and people’s privacy. Haley is too funny, and that sure gives her a good workout! Around here it’s balls. If you pick up a ball our beagle goes nuts and the other dogs follow her. You’d better throw it fast or all heck breaks loose! Haha, I can imagine them barking at you if you hold the ball too long! What better way to release some of that energy too. ? Like Haley, Laika goes nuts for bugs & bubbles. So much so that I’ve been woken up numerous times in the middle of the night by her howling at a spider on the wall… It doesn’t “bug” me that much though – I find it to be one of her little endearing quirks. Seeing Haley with that drone makes me want to see if I can find one (or something similar). Laika has such an awesome personality, I would love to have a spider alert system like that, lol! ? Squirrels for both pups, and leaves flying through the air for Missy 😉 Not video of Miss Haley hopping after the drone was super adorable! Thanks, Barbara! Miss Haley sends her thanks too. I would love to see a video of Missy chasing leaves if you haven’t raked them all yet, I bet she’s funny to watch. ?